When you think of Hermione Granger, “dancing like a boss” probably isn’t the first thing that comes to mind. However, that may change, because a “dancing Hermione” from the London Pride parade is currently going viral, and it’s epic. 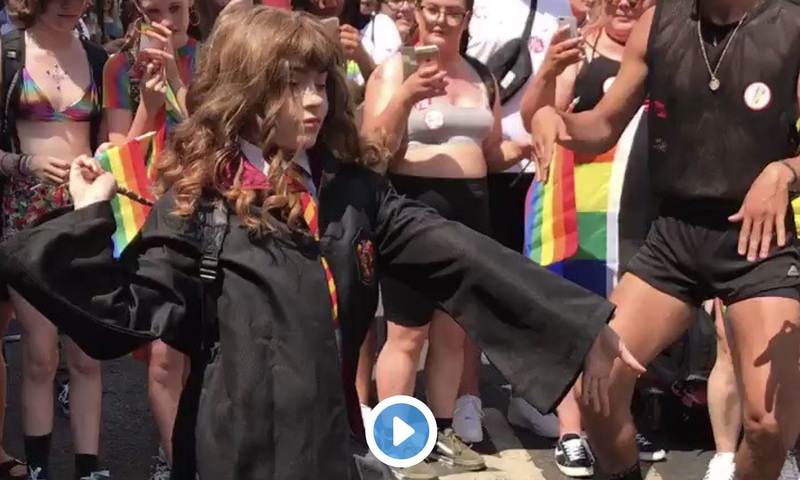 On Saturday, July 7th, social media users captured video of performer Kelsey Ellison reprising her “dancing Hermione” moves during the Pride parade in London. Ellison took to the street wearing a classic Hogwarts uniform (which even included an authentic looking wand and backpack) and danced her heart out. Despite the fact that it was over 80 degrees in London that day, Ellison twirled around, finishing the routine with a split. This isn’t the first time Ellison has shown off her moves dressed as the classic Harry Potter character. She’s a YouTube star and self-proclaimed “Potterhead” who first made waves as dancing Hermione at MCM London’s Comic-Con earlier this year (her YouTube page is also full of Harry Potter fan videos, of course). "I’m just so thankful and grateful I live in a country where we can be proud a celebrate who we are," she also wrote. We love that Ellison’s “dancing Hermione” brought so much joy and positive attention to the London Pride parade. Now let’s just hope her legs are okay after that split.